Can I have an option to see the cell numbers on top of the screen, near the account name? It would be very helpful to choose which telephone number I would like to see in a pull-down menu, right next to the name, so I don't have to go into general info when I'm in the payment screen. Added (Meanwhile only in Tuition) 3/24/2019 Added to Fundraising. 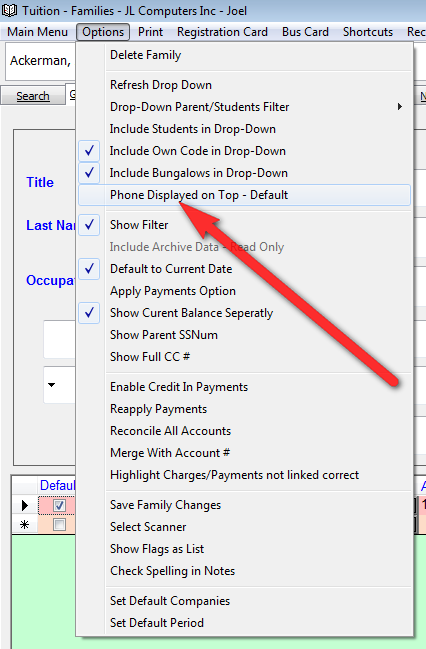 To use choose Phone Displayed on Top from the Options menu. 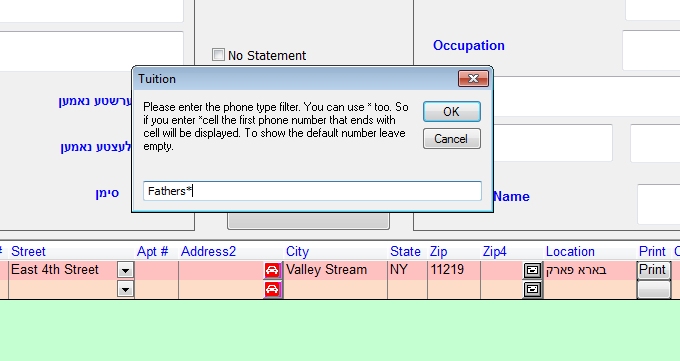 Enter a Phone filter like displayed in the message. We also added an option to see all phone numbers if you hover a second on the phone number box. I logged out and logged back in, and do not have it yet? Can we have this option in fundraising as well to see all phone numbers if you hover a second on the phone number box. Added the hover option by Fundraising too. Added the Phone on Top option to Fundraising too.